Welcome to The Pinnacle in Yaletown. This highly dynamic area is located on the the waters edge of False Creek in Vancouver's upwardly trendy urban neighbourhood which is comprised of residences, offices, restaurants, boutiques, cafes, and more. The Pinnacle is in the cusp of it all. 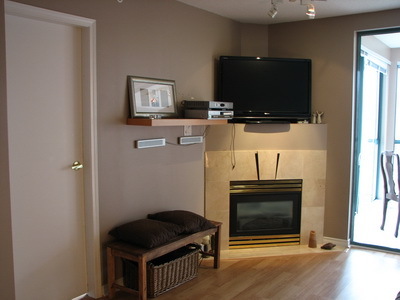 This one bedroom and one bath unit is an open concept with new laminate flooring throughout the entrance, living and dining areas. 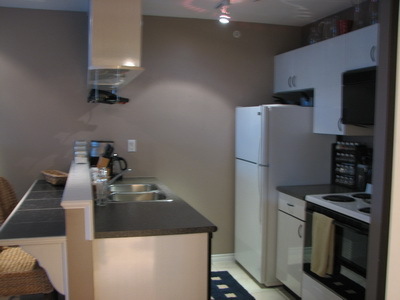 The kitchen is complete with stove, fridge, microwave, and dishwasher. 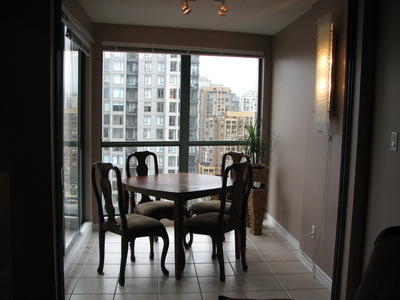 This suite is bright, with lots of natural light provided by a wall of windows that also provide a view of the Cambie and Granville Street bridges and False Creek. 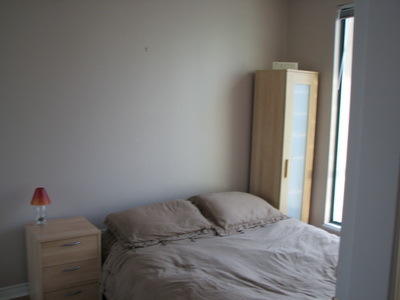 There is a TV in the living room and a smaller wall mounted unit in the bedroom, both with DVD players. 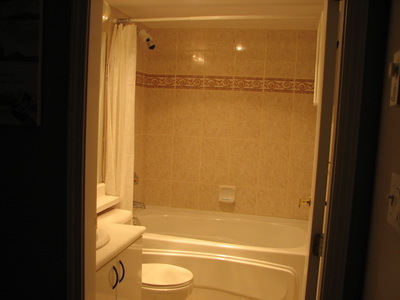 An in suite washer and dryer are tucked away in the bathroom. 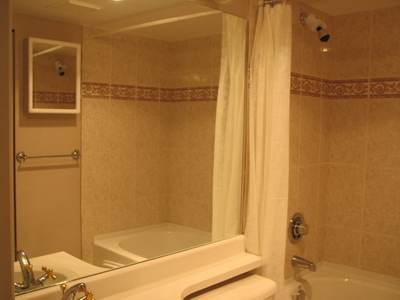 Building amenities include an exercise room with treadmill, universal gym and weights, indoor pool, sauna, and hot tub. This secure building is complete with an underground parking spot. There are also outdoor lounging areas, including the roof top deck, with views to the local mountains and the ocean. 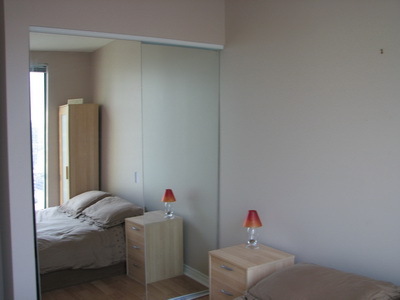 This wonderful condo will provide you with all the comforts that you desire and more. 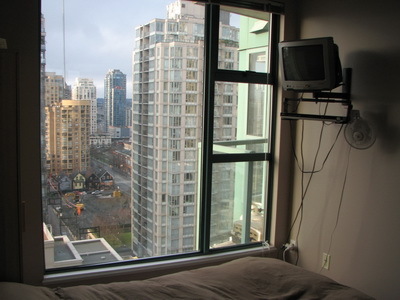 Today's Yaletown is the neighbourhood of choice for urban trendsetters. Yaletown's streets are surrounded by condominium buildings towering over renovated brick-warehouse lofts. Some of the city's hippest destinations are here high-end galleries, chic fashion and furnishings boutiques, swanky restaurants, brew pubs, trendy salons and even movie sets share its narrow streets. Yaletown's sea wall includes a mix of walkers, joggers, cyclists, roller bladders, and many canine friends. The walk has many special features including extensive landscaping, lighting, artifacts, and green spaces including a new park under development called George Wainborn Park. The waters of False Creek can be enjoyed by Aqua Bus. The Aqua Bus also leaves on a frequent schedule for destinations such as Granville Island, Stamps Landing and Science World. Public transit, including the Sky Train, is just five minutes away. Yaletown is proud to be a part of this wonderful, exciting piece of Vancouver and is situated within walking distance to Canada Place, parks, upscale shopping, groceries, restaurants, nightlife and the waterfront. 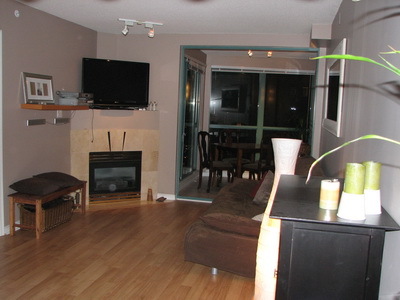 There is easy access to Whistler and other Olympic venues, as well as English Bay and Stanley Park. You could not ask for a better place to stay. This is city living at its best. 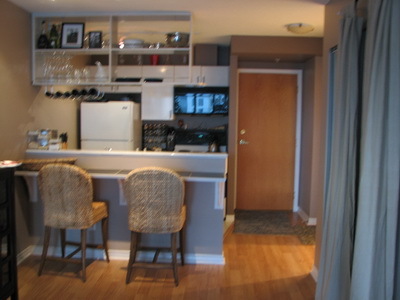 Hurry to book this amazing condo. Pull out futon in the living room can sleep two.